Providing Tree Service in Tarpon Springs since 2007. If Trees Could Talk is a tree preservation service, and we believe that tree removal is a last resort. We understand that sometimes trees do need to be removed, but if there is a way around it, that's what we will suggest. 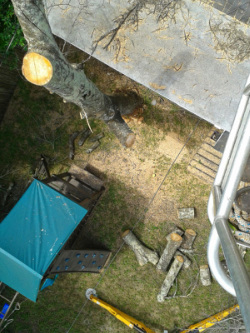 We are fully equipped to safely and properly remove any tree. If Trees Could Talk will not remove any tree without first obtaining an approved permit from the county or city permitting department, whichever applies. This protects the homeowner from any fines or liens that may be applied should a tree be removed without a permit. We can provide assistance with the permitting process. Interested in a Tree Removal Estimate? Offering Tree Removal throughout Tampa Bay and the surrounding areas. Including but not limited to, Hillsborough County, Pinellas County, Pasco County, Tampa, Clearwater, Clearwater Beach, Palm Harbor, Dunedin, Oldsmar, Tarpon Springs, Holiday, New Port Richey, Port Richey, Hudson, St. Petersburg, Countryside, Pinellas Park, Largo, Belleair, Belleair Beach, Indian Rocks, Indian Rocks Beach, Safety Harbor, Ozona, Town and Country, Citrus Park, Sarasota, Davis Island, Hyde Park, Apollo Beach, Pass-a-Grille.